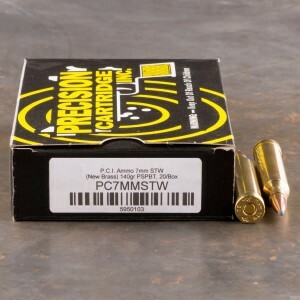 7mm STW ammo is also known as 7mm Shooting Times Western.Originally designed in 1979 by Layne Simpson, the Shooting Times moniker was adopted due to Layne Simpson’s contributions to Shooting Times magazine. The 7mm STW uses a 8mm Remington Magnum as its parent case, necked down to accept a much lighter 7mm projectile. The advantages of a lighter projectile in a case meant for a larger projectile is the advantage of case capacity and velocity. 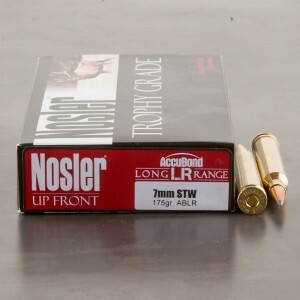 A smaller, lighter round with the case capacity of a larger round allows the lighter round to achieve a higher velocity when the same amount of powder is used. The 7mm STW can be loaded with a variety of different bullets, which adds to the round’s versatility. Bullet weight can range from 120 grain to 175 grain. Velocities will differ between different projectile weights. Lighter projectiles can reach well over 3,000 feet per second and heavier rounds just barely beating that mark. The round was recognized by SAAMI in 1996 and is being produced by Remington, Federal, and Speer today, which you can often find in-stock and for sale here at AmmoToGo.com.